LYME — It wouldn’t be quite accurate to say that KJ Dell’Antonia and Jessica Lahey are winging it. 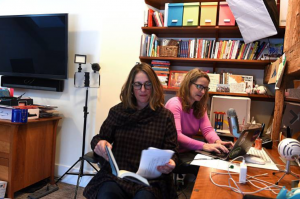 Both women pull out pages of notes as they meet in a hastily tidied upstairs office in Dell’Antonia’s sprawling, well-appointed farmhouse to record the latest episode of their podcast. Both, too, are distinguished writers who know their way around an interview. They want to dive deep into the life and work of the inimitable Jackson. But they’re also hungry for the nitty gritty and unafraid to ask the questions more self-conscious hosts might deem banal.